Could Driverless Cars Greatly Reduce Sales? Could driverless cars fundamentally change auto manufacturing? In the past, we’ve looked at the potential impact driverless cars could have on car insurance. There’s no doubt that eliminating the biggest risk factor – human drivers – could help reduce accidents and lower car insurance rates. But it appears unlikely if mass adoption of self-driving cars will occur anytime soon. Most of us are familiar with Google’s efforts. They’ve had experimental versions of Toyota Prii that drive themselves on the roads for a few years, racking up hundreds of thousands of miles. Google is currently testing their most recent versions in the desert of Nevada. I spend a lot of time perusing and contributing to various social media platforms. And every now and then, one can find real gems lurking on there. 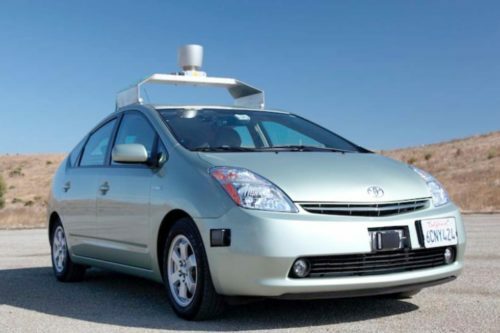 I recently came across a post on Google + that raised some interesting questions regarding the impact self-driving cars could have on the way we think about and use cars. That post, authored by Koushik Dutta and entitled “The Unintended Effects of Driverless Cars” is the first time I’ve seen anyone raise the issue of what cars like those being developed by Google will mean for auto manufacturers. Families would be able to cut down to a single car. Eventually, car sharing could become more popular. Since driverless cars handle the actual tasks, they could handle carpools to and from school, as well as those going to work. Car sales could be negatively affected, since we won’t be using as many cars. In fact, they could lead to a situation where sales are only 5 percent of current levels. Such a falloff in sales would disrupt auto manufacturing, and could lead to a huge shakeout in the industry. We’re not convinced Americans will share cars. We’re not even convinced a majority of Americans are ready for self-driving cars, even if they came to market tomorrow. Cost. The equipment added to make a car self-driving would add thousands of dollars to its price. Dutta’s ideas represent a significant sea change of generational proportions. What do you think? Could these predictions come to pass, or do they represent too much change, too fast, to have a chance of happening anytime soon? Or at all? Cecil Helton is a U.S.-based writer and editor with passions for cars, motorcycles, boats, technology and social media. Much of his professional life since 1996 has been web-centric, and he’s written and developed content on a variety of subjects. His work in the houseboat industry received wide acclaim, such as winning the 1999 Cisco Systems Growing with Technology award and being named one of five finalists in the manufacturing sector of the 2000 Computerworld-Smithsonian Awards. As an Air Force brat, he spent much of his childhood in a two-year cycle of moving to a new place, making new friends, establishing a life, and then moving again. Destinations included: Kentucky, Illinois, Texas, the Greek isle of Crete, California and Ohio. Today you’ll find Cecil coping with his 15 year old son’s decision to pursue a motorcycle license at the same time he gets his driver’s license, being active across the web on multiple social media sites, and of course, writing articles and creating content on automotive and car insurance related topics right here at CarInsurance.org.